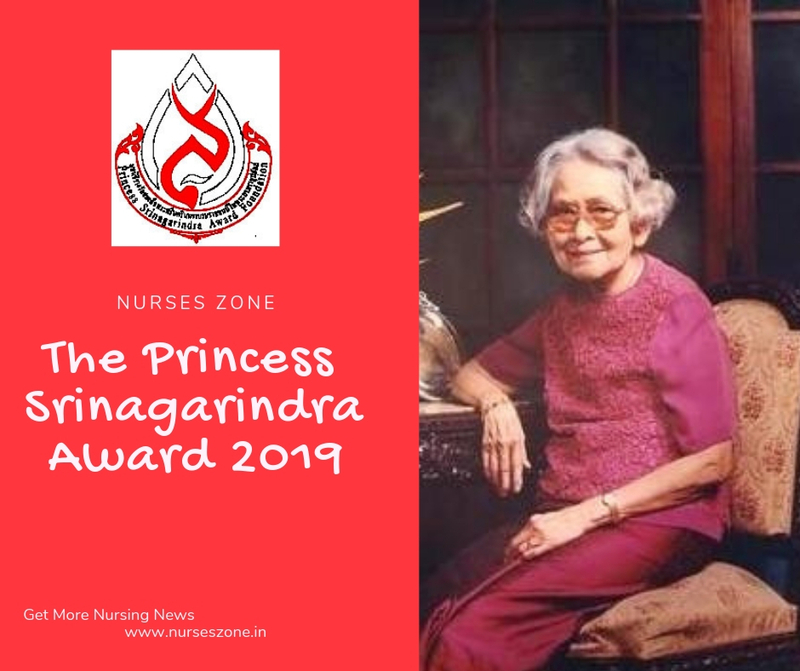 The Princess Srinagarindra Award Foundation (PSAF) under the Royal Patronage calls for the nomination of a nurse and/or midwife for the 2019 Princess Srinagarindra Award. The PSAF was established in commemoration of the Centenary Birthday Anniversary of Her Royal Highness Princess Srinagarindra Mahidol of Thailand on 21st October, 2000. The Princess Srinagarindra Award, to be conferred as an international award for an individual or group of registered nurses and/or registered midwives, is established in honour of her Royal Highness Princess Srinagarindra Mahidol and in recognition of her exemplary contribution towards progress and advancement in the field of nursing, midwifery and/or social services. The national nursing authorities or individual or group of individual can nominate ONE individual registered nurse and/or registered midwife or a group of registered nurses and/or registered midwives from each country who has made significant contribution for the development of the nursing and/or midwifery profession, health system and/or health and quality of life of the people. The information and nomination form is adhered below. The nomination form and the required document in English must be submitted from now upto May 31st, 2019. The Princess Srinagarindra Award Foundation was established on 21 October 2000 in commemoration of the Centenary Birthday Anniversary of Her Royal Highness Princess Srinagarindra Mahidol. The Princess Srinagarindra Award, to be conferred as an international award on an individual or group of registered nurses and/or registered midwives, is established in honor of Her Royal Highness Princess Sringarindra Mahidol and in recognition of her exemplary contribution towards progress and advancement in the field of Nursing, Midwifery and Social Services. The required documents must be completed in English and received by the Foundation by May 31, 2019. 4. Have made the contribution(s) during the years immediately preceding the award or as a cumulative effort that continues to the present time. Before completing the Nomination Form, please read the brochure entitled “Princess Srinagarindra Award” and the Annex 1: the Eligibility Criteria and Selection Procedure”. a) This form must be typed, and submitted as an original document, in English, with original signatures in all places specified. b) In addition to an individual registered nurse and/or registered midwife, a group of no more than four (4) registered nurses and/or registered midwives who have worked together on the same specific project for a period of time and for which the outcomes have significant implications for nursing practice, education, health care or further research, may be nominated. Achievements must be submitted as a group performance while personal data must be completed by each member. the Ministry of Health are the organizations at the country level who may be the sponsor. e) Each of these entities should be aware of and support or have no objection to the nominee(s). f) A Curriculum Vitae of the nominee(s) should be attached as per Annex 1.
g) The names of the nominee(s) must be submitted to the nominee’s National/State Nursing Council (NNC) or National/State Regulatory Authority (NRA) for certification. Please see Part VI. h) One Country should nominate ONE person or ONE group for the Award. i) All forms and documents must be mailed to Princess Srinagarindra Award Foundation (PSAF) and received by PSAF no later than 31 May, 2019. Advance information can be sent by e-mail. In your view, please comment briefly on the reason for the nomination, including the nominee’s work or contribution to the work, the outcome and the significant impact of this work for the development of the nursing and/or midwifery profession and improvement of the quality of life and health of the people. One additional page may be added. State in concise terms the significant contribution or impact you have made, within the nursing and/or midwifery profession, and/or for the development of the nursing and or midwifery profession and quality of life and health of the people. One additional page can be added. Please complete your Curriculum Vitae in Annex 1.
to receive the Princess Srinagarindra Award and have no objection. The application must be certified by National/State/Provincial Nursing Council (NNC) or National/State/Provincial Regulation Authority (NRA). Signature of the President, Executive Director, or other duty authorized representative of the NNC or NRA. A. Full name of the nominee (in capital letters) as it appears in your passport or on your birth certificate. B. Educational background: identify year of graduation, diploma(s)/degree(s), school/university, country. Please start with lowest to highest qualification in relation to nursing and midwifery. C. Working experience: identify year, position, place of work. Please start from the current one. E. Awards: The year you received the award, name of the award, the award recognition (on what achievements), and organization giving the award. F. Research publication: List not more than 10 key research reports or publications. A research report: identify name of author, year, title, place of printing, country. An article: identify name of researcher, year of published, title of the article, name of the journal, journal number and pages. to arrive no later than May 31.